The most thought providing thing about this picture – is that the paint job really is uniquely awful. That being said – if it was on a 1995 Ford Taurus, it would be viewed 100% differently. Reminds me of something I heard the flower children did back in the ’60’s. WOW … what year is it? I have a Jaguar. Mine has the jaguar hood ornament that they’ve outlawed now. I’d never do this to it even though I think it’s cool looking. What???? Who would do that to a Jaguar??? From what I understand though, I think it might’ve only been VW bugs that were painted in loud colors a long time ago…I’m not sure if other makes/models of cars were painted this way. I know I heard people would paint smily faces & peace signs on their vehicles, as well as lots of flowers-perhaps daisies more often than other flowers? This is like a tie-dyed tee shirt. The owner of this car is probably looking for attention, since most people paint their cars 1 solid color. Oh no! They missed a spot. No hesitation in colouring an expensive car…beautiful photo of car art, and neat parking…. Ou comment faire de la merde avec un bijou ! Difficile de faire plus moche ! que bonito auto deportivo, muchas felicidades. Love this. Very colorful and very photogenic. Wow, that is definitely one eye-catching car! Reblogged this on Poorva's Blog . I was in Cape Town recently where I met this cars sister bright colours but with a brightly coloured beaded rhino attatched to the bonnet……..I wish I had kept the photo now! Its so beautiful there that I over loaded my camera. enjoyed looking at your pics…am new to word press and not too technical but hope to see more of them! Reminds me of the cars I colored as a little kid. Cool picture! Mind checking out my blog about movies? 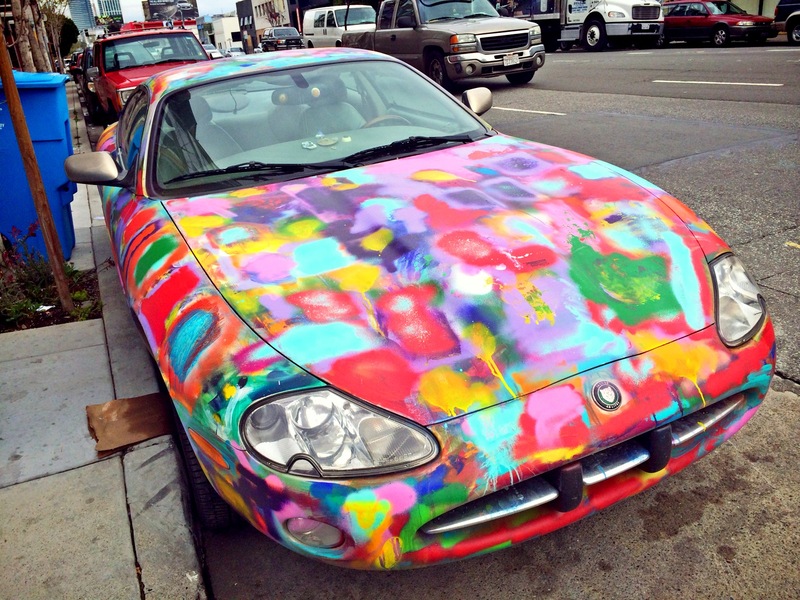 I don’t care if it’s a sin to paint a jag like this or not; it made me smile! Cool, It looks like a Kandinsky circle painting! Nice one! Living in the UAE, I see tons and tons of luxurious cars on a daily basis. However, never seen such an outstanding one. Love it. Adds color to life. Thank you for sharing. This is beautiful and fun and is almost like a giant flower itself. Really like your work. My son is non-verbal autistic and color therapy is one of several things I am trying out. Golden Yellow, Bright Orange, Ruby Red, Sky blue, emerald green are the colors that help him. I wanted to paint my SUV with the collage of these colors like in picture. But haven’t gathered the courage to do it. Hilarious. The hippie generation grew up and did quite well for themselves, but…retained their generally horrible sense of taste.